The head of aircraft finance giant International Lease Finance Corp urged India on Wednesday to release six passenger jets held "hostage" by a bureaucratic dispute after struggling Kingfisher Airlines failed to pay for them. ILFC had warned in January that a failure to return leased airplanes to their true owners when airlines cannot pay their bills could put the country's aviation growth at risk by scaring off funding. According to Los Angeles-based ILFC, the Delhi High Court ruled last month that ILFC could have access to its aircraft to ensure they can be refurbished and maintained. But ILFC Chief Executive Henri Courpron told Reuters that the situation on the ground remained unresolved. "We have made legal and political progress but people are not following instructions from the government," Courpron said in a telephone interview. "We have to stop this hostage situation." He did not say which Indian authorities or people he held responsible for failing to apply the court's decision. Ultimately, ILFC wants to fly the Airbus aircraft out of India to allow them to be used by other operators. But that would require the consent of Indian authorities. For now, the planes are sitting idle in Delhi, Mumbai and Chennai. Kingfisher's financial difficulties have left the airline's fleet grounded since October. Germany's DVB Bank said in December it had sued India's aviation regulator and Kingfisher to have two planes it financed for the troubled carrier de-registered, a possible first step toward recouping its funds. The two disputes are seen as an important test of an international agreement known as the Cape Town convention, designed to make it more attractive for leasing companies to invest by duplicating repossession rights available in the United States when airlines default on lease payments. Courpron said he expected the sale of a majority of ILFC to a Chinese consortium by its owner, U.S. insurer AIG, to go ahead as planned in the second quarter, dismissing doubts expressed by some delegates at a Florida aviation conference that it would. About 38 per cent of the audience at an industry panel predicted in a straw poll that the Chinese sale would not go ahead, but Courpron said ILFC was solely focused on it. Kingfisher Airlines CEO Sanjay Agarwal, in a letter to the DGCA on 08-Mar-2013, reiterated the carrier plans to resume operations, with 11 ATR and 10 A320 aircraft (First Post, 12-Mar-2013). The airline has also provided a schedule which outlines plans for around 70 Airbus and 100 ATR weekly services, to destinations including Kullu, Jaipur, Dehradun, Hubli and Vijayawada. The Airports Authority of India (AAI), the nodal agency which manages the country's airports, will follow the Civil Aviation Ministry's directive on releasing Kingfisher Airlines' leased aircraft. The Civil Aviation Ministry is yet to take a call on releasing the aircraft to leasing companies and the matter is under consideration. V.P. Agrawal, chairman of AAI, said India will also have to honour the international convention for releasing captive aircraft. Civil Aviation Secretary KN Srivastava is in the process of issuing a letter to all airport operators in “3-4 days”, directing airports to release aircraft that have been de-registered by the authorities and are no longer held by Kingfisher. “This would happen very soon,” Arun Mishra, director-general of civil aviation (DGCA), told. The ministry decided on this step after a meeting with interested parties and stakeholders, including the Airports Authority of India, or AAI, in Delhi about a week back. The de-registration will decrease number of aircraft on Kingfisher’s air operating permit to 15. Experts said it will not be easy for the airline to restart operations any time soon. VP Aggarwal, chairman of AAI, told ET that AAI has agreed to release the 15 de-registered aircraft to their respective leasing firms keeping in mind the larger interests of the airline companies and the need to honour the Geneva Convention, of which India is one of the signatories. “We do not want a major fallout with any leasing company. So we have agreed to the suggestion and a formal letter on this guidance will be issued soon,” Aggarwal told ET. Aggarwal added that AAI will now begin recovery proceedings against Kingfisher soon. Good move.....else like in the post 1996 era....if leasing companies had to struggle to get back their aircraft,they would not be keen to lease some to Indian operators in future. UB Group chairman Vijay Mallya questioned why banks are continuously speaking to the media on loan recovery from Kingfisher Airlines, tweeting: “I seriously wonder what motivates bank chairmen to constantly speak to media on loan recovery from Kingfisher Air. What about others?” (Business Standard/PTI, 20-Mar-2013). The comments came after State Bank of India (SBI) chairman Pratip Chaudhuri said it is taking all steps to recover the loan provided to Kingfisher Airlines (PTI, 18-Mar-2013). He explained: "We are blazing all guns and taking all steps to recovery [of Kingfisher loans]," he said, adding: "There is a core group. They are assessing what are securities what can be disposed of quickly then they are put on auction... That is how it goes". Kingfisher Airlines Ltd. has submitted a plan to India's aviation regulator for the grounded carrier's revival, Chairman Vijay Mallya said Wednesday. The proposal includes payment of overdue salaries, Mr. Mallya told reporters. He declined to give a timeframe for getting Kingfisher back in the air. Kingfisher has been grounded since Oct. 1--first due to a strike by its employees over non-payment of salaries and then because of license problems. Kingfisher Airlines employees have reportedly requested the Indian Government prosecute Kingfisher promoter Vijay Mallya for not paying salaries and has threatened to disrupt Indian Premier League (IPL) cricket matches of the Royal Challenger Bangalore (RCB), the team owned by Mallya (PTI, 20-Mar-2013). The action is being considered amid the “total neglect and ignorance” by the company as well as the government of the carrier's employees. Kingfisher Airlines Maintenance Association president Santosh Gautam said: "If Gopal Kanda, promoter of MDLR airlines, can be prosecuted for suicide of an employee why can't the government prosecute Vijay Mallya for suicide of the family member of his employees". Employees have also requested the Board of Control for Cricket in India not to allow RCB to participate in the upcoming IPL. In letters to India's President, the Prime Minister, the Chief Justice of India, UPA Chairperson Sonia Gandhi, Civil Aviation Minister Ajit Singh, the Directorate General of Civil Aviation Arun Mishra, employees said: "Enough is enough. We want a clear reply from him whether he wants to run the airlines or wants to close it down. If you want to close it, then please pay our dues". Are there kf staff still awaiting a restart......I believe most should have moved on to other jobs by now. German Bank DVB representatives have sought de-registration of two planes of the grounded Kingfisher Airlines at a meeting with aviation regulator DGCA on Monday. The two planes were sent to Turkey for repair and maintenance where DVB seized them. However, unless the planes are de-registered in the lessor country, the German Bank cannot reclaim them and lease or sell them to other carriers. International Lease Finance Corporation (ILFC) has succeeded in removing one A321 of its six A320 family aircraft that it has on lease with troubled carrier Kingfisher. India's aviation regulator Tuesday said 15 Airbus planes of cash-strapped carrier Kingfisher Airlines Ltd. have been de-registered on request of the leasing companies which own the jets. The planes were de-registered in the last two months and will be returned to the lessors, Arun Mishra, Director General of Civil Aviation, India, told reporters. After a long struggle, the Directorate General of Civil Aviation (DGCA) has allowed lessors of 14 out of 17 deregistered aircraft of Kingfisher Airlines to take them back. As of now, all the aircraft are parked at various airports across the country. "Of the 17 deregistered aircraft of Kingfisher Airlines, three of them are under litigation and cannot be taken back by the lessors till courts take a decision on the litigation. We have allowed the owners of the rest 14 aircraft to take them back and use it for operations," DGCA Arun Mishra said on the sidelines of an event organised by CII, IATA and GMR. Airports Authority of India had impounded the maximum number of these aircraft and were releasing it only after the payment of Rs 10 crore for Airbus A320 and Rs 2.5 crore for small ATR aircraft. ^^ Long overdue and I think the international lessors have gone through too much pain already and too much red on their ink just through the unpaid lease rentals and the massive damage done to their a/c by IT. Some people are just not getting a job despite their best efforts- that is it!!! It is easy for people to make sarcastic comments stting in their comforts of their jobs elsewhere or in their armchairs but spare a thought for those who have been trying their best and nothing came out of it . The KFA fiasco for the lessors is going to come back to haunt Indian carriers, especially Jet, which is a master the leasing of aircraft. This is one more higher fixed cost item of operating in India. A majority of the 15 leased planes that still remain on Kingfisher Airlines's (KFA) name may be headed to the scrapyards. While 13 aircraft leased to the grounded airline have been de-registered from the airline's name and will now be flown out of India, lessors of 15 planes have discovered that their Airbus planes are in simply no condition to fly. "These lessors have discovered that aircraft parts have been so badly cannibalized that it is very difficult to restore the planes. In its last few months of operation (KFA stopped flying from October 1, 2012), the airline kept taking parts from its fleet to keep a handful of planes airworthy. Now the planes have been ravaged beyond repair and they can't fly," said a senior Airports Authority of India (AAI) official. The planes rendered unfit to fly are the Airbus A-320s, each of which today costs upwards of Rs 500 crore and leasing a new one costs about Rs 2 crore per month at current rates. Now AAI brass are going to hold an internal meeting this week to see how precious airport parking slots occupied by these planes across Indian airports could be freed up. "The only way for these aircraft may be the junk yard. Lessors will drag KFA promoters to court to recover their losses," the official said. Lessors have not even applied to the Directorate General of Civil Aviation (DGCA) to get these 15 planes de-registered. The reason: While allowing some planes to be de-registered last month, DGCA chief Arun Mishra had ruled that lessors will have to pay parking charges to airports from the date their planes cease to be in KFA's name to the date they fly out. Something these 15 planes can't do. KFA till recently had 40 planes — 10 owned by it and 30 leased. Of the 30 leased, 15 are stuck on ground and 13 were de-registered. Two aircraft have been seized by service tax authorities. Aviation secretary K N Shrivastava recently met the tax authorities for freeing these planes but since they are co-owned by the airline, they remain impounded. Shrivastava, who is trying to restore India's credibility in the eyes of foreign aircraft lessors so that other desi carriers do not find it tough to rent planes, recently made it possible for lessors to start re-possessing their planes rented to KFA but which had been impounded by various agencies the airline owed money, like airports, banks and tax authorities. Kingfisher Airlines has lost a legal battle with German aircraft leasing firm DVB Aviation Finance Asia PTE Ltd, as per a Business Today report. The Delhi High Court (HC) yesterday asked the Directorate General of Civil Aviation (DGCA) to deregister two planes leased to the now grounded carrier lying in Istanbul in Turkey. "The petition is allowed. DGCA is directed to deregister the two aircraft which are lying outside the jurisdiction of this court," Justice Rajiv Shakdher said and asked the airline to furnish original documents of two leased aircraft to the German firm within four weeks. Citing a previous judgement on the issue, the Court said DGCA cannot withhold the deregistration of the aircraft on the ground that the airline owe money to the government and its agencies. "It is made clear that if any dues remain payable from the airlines, the respondent (DGCA) can take recourse to appropriate measures against respondent (Kingfisher)," Justice Shakdher said. Lessors of 15 planes have discovered that their Airbus planes are in simply no condition to fly. Wow - no surprise that a/c were cannibalized till they were dead, but how does the lessor get their money back? Sorry if I am asking a dumb quesiton and I would like the experts here to answer. Doesnt it cover some of the damages? Also it is not a top secret that cannibalisation of parts is bound to occur when an airline is in financial trouble. What were the lessors doing all this time?? Werent they having periodic innspections ??? While I am not justifying the acitions of KFA, looks like the lessors woke up too late??? A suspicious fire broke out in a warehouse belonging to Kingfisher Airlines, destroying aircraft spare parts and other accessories stored there Friday morning. Though the godown houses aircraft spare parts, computers, expensive accessories and stationery, no staff or security were present at the time. Moreover, there were no security measures like CCTV and proper fire safety equipment. The fire was reported to the emergency services by the owner of the building, who lives nearby. Some 13 fire tenders and 80 fire fighters worked for five hours to douse the blaze. The Fire and Emergency Services said it was difficult to pin the source of the blaze. “There were no vents, exhaust fans and no emergency exits,” said a senior fire official who was part of the operation. Smoke had engulfed the entire building and the fire fighters broke open the roof to let it out, he added. There were some fire extinguishers and smoke detectors, but all were defunct. “It looked like the [latter] were there just for the heck of it and was not activated,” Chief Fire Officer (West Division) Markadeya told The Hindu. The warehouse itself appeared to have been constructed in haste and had not obtained a No Objection Certificate from the Fire and Emergency Services. None of the fire safety equipments installed at the warehouse has been certified by officials. A senior police officer described the fire as fishy and said there would be a detailed investigation. “The value of the lost goods is yet to be ascertained,” he said. The fire broke around 11.20 am in the godown where airplane spareparts worth crores of rupees were stored and almost all the materials have been reportedly gutted in the fire. Some sort of sick game to recover spares through insurance ? Insurance companies do not cover negligence. There is no way any insurance company is going to cover this loss. I doubt any insurance company would have insured this premise if the safety measures were absent. 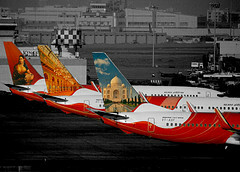 India's Mumbai and Delhi international airports have reportedly claimed that Indian law prevails over international law in a dispute with lessors over the future of grounded Kingfisher Airlines aircraft, stating they could not ignore a "stay" order from the Delhi High Court (Reuters, 19-Apr-2013). This could further complicate lessor attempts to record aircraft and their willingness to deal with Indian airlines in the future. DVB board member Bertrand Grabowski said: "Some of us, including DVB, are still skeptical that the Cape Town Convention will completely change the situation in India because courts tend to read the law so that Indian law prevails. We will need a few more months to evaluate carefully the situation." Meanwhile, India's Director General of Civil Aviation Arun Mishra said: "The government of India is fully committed to protecting the interest of the lessors so that the leasing business is not hampered in India". Mr Mishra said the DGCA had recently deregistered 19 Kingfisher aircraft. Kingfisher's Airbus A319, VT-KFH which had been stored at DEL has been returned to her lessor, and ferried to SAW today. The Delhi High Court (HC) yesterday asked the Directorate General of Civil Aviation (DGCA) to deregister two planes leased to the now grounded carrier lying in Istanbul in Turkey. VT-KFH, one of the two that had been deregister by the DGCA, has been re-registered as EI-EYA, and ferried to Dublin. So what is The Fat One up to these days? It looks like he is keeping a low profile. Apparently, he is not to be seen in the IPL matches when his team his playing. The Airports Authority of India (AAI) has asked grounded Kingfisher Airlines to vacate space it occupies at its airports across the country. The Vijay Mallya-owned airline, which hasn’t operated a single flight since October last year, has been asked to remove all hardware and counters at AAI-run airports. “We had written to the airline management to vacate the hangar space they occupy at our airports,” said an official. “Our officials have started meeting Kingfisher staff at respective airports to take forward the process. Kingfisher aircraft are occupying premium space and we have told them to move to the apron area. Similarly, counters and other hardware belonging to the airline have been lying vacant at airports. This precious space can be allocated to other airlines. Kingisher did not offer comments for the story. Could this be the reason why G8 has not been allowed to move into T1A at BOM. ILFC has taken possession of a (former) IT A320. The former VT-KFX has been ferried out of BOM to Bangkok Don Mueang yesterday under her current regn. EI-EYG. Hitesh Patel, Executive Vice President, Kingfisher Airlines Ltd, who joined the airline nine years ago and was instrumental in the airline's launch in 2005, has put in his papers, as per a TOI report. Patel was also active in meetings with the Directorate General of Civil Aviation (DGCA) and talking to prospective investors after airline was grounded last October. According to sources, “Hitesh Patel is returning home to New York and will take a much-needed break before resuming work elsewhere. It was not easy facing the ire of employees and scores of other agencies, who have not been paid for months.," It is learnt that Patel stuck to the airline when the management was talking to investors but when nothing seemed to materialise, he decided to call it a day. It's been awfully quiet few months on the Kingfisher front. Something may be brewing. Any news on the Pay front and any truth in that 2 months salary was paid before IPL start? What are they doing now? Just pure time pass. Well it's the time to pay your employees and get into/concentrate on his other ventures and businesses. Been quiet though.....Long time now. I think its about time to shut this thread on IT completely.